subroutine Trace – If successful, the Runner loses click, if able. Viper might be the new Eli 1.0 post-MWL. One influence, str 4, 2 trace-3 subs. AI breakers are such a problem now that basically all ICE is porous so the 'disadvantage' of Viper is quite minimal. At 3 to rez and armed with s that end the run as well as punish the runner for facechecking (losing a ) Viper is extremely similar to Enigma. The only difference is that it trades strength for porousness and vulnerability to runner . Given that Faust and Parasite are such big threats this is a good trade in the mid-2016 meta. The most useful function of Viper is as a one-inf card that can help get the corp deck closer to 6 cards in order to activate the Jeeves alliance. 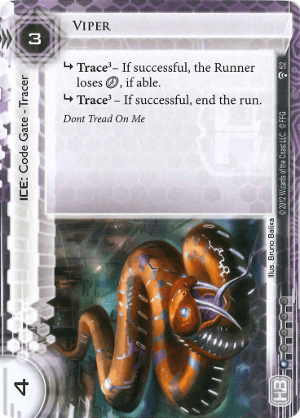 Viper also slots well into every other faction too: needs code gates, needs ETR ICE with decent strength and low rez cost and also benefits for the same reasons as Jinteki, with the added bonus of having trace boosting cards in-faction. P.S. Even though it is porous, it still has a degree of built-in Account Siphon defense, since the corp can pump an unbroken trace to dump s.
Like Caduceus, Viper is one of the Snake ICE, with a very similar setup. It may be a little easy for the runner to pay through the traces if they wish, but truthfully told even for a one link runner that would be a minimum of four credits. Perhaps only two credits if running on the last click, but that is a very dangerous proposition. It is also something that some newer concept HB decks are trying to push - Run last click and face the dangers, or run early and let me rez my Bioroids at a reduction. It has seen a lot of use in that style click denial deck, and has even seen some use in combination with Enigma. Its higher strength yet the same rez cost is balanced by the fact that it is a trace style ICE, but that higher strength keeps it relevant later into the game. Plus it means that other resources must be spent for the all too common fixed strength breakers to be used to get through it, which is a different sort of tax in itself.